Based on an article in AUCTIONEER magazine, auctioneers aren’t common, and female auctioneers even less so. 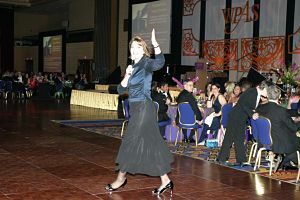 I was the first female auctioneer to ever work this performing arts auction of ~600 guests. I’m behind in my reading, so it was only recently I read the June 2009 AUCTIONEERS magazine and an article called “A Rare Occupation.” It talks about how auctioneers are few and far between. 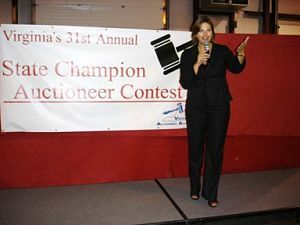 I’m often the only female to compete at VAA auctioneering competitions. In one unusual year, there were three women! Usually it’s one or none. The VAA has men and women compete in the same category (which I prefer). Combining Rob’s thoughts with some of my own ideas, let’s look at some reasons. 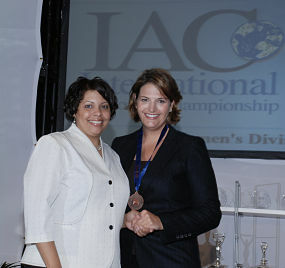 The International Auctioneers Championship competition (sponsored by NAA) offers a female-only division. Here I am with champion Denise Shearin. There is a high failure rate. I’ve heard it said at auction conventions and trainings that the percentage of those working in the auction business within five years of graduating from auction school is less than 5 percent. Wow! I suspect that most people look at the bid calling portion of the work and find it exciting. But they don’t realize the amount of work that is involved to get established, book jobs, and work consistently. Once they do, they reconsider their career choice. Auctioneering is still predominantly a male profession. For the right woman, it can be a rewarding career. The auctioneer is constantly being judged by personal conduct and auction results. If an accountant prepares a bad tax return, the only people who know are the accountant, the client, and a representative from the IRS. But if an auctioneer fails to maintain his or her professionalism on the stage, a crowd of 200, 500, or 1000+ have just witnessed it. Like an actor, an auctioneer is only as good as his or her last performance. New auctioneers have a difficult time getting established because few people want to entrust the sale of their property to someone who has little experience. Regardless of the item — a $2 million home or a $5000 vacation package — I’ve found that most clients are nervous before an auction. They aren’t sure what’s going to happen, and they want it to go well! My first few auctions were 100-200 people, which didn’t really bother me. Then I started working at events of around 400 people. That was more nerve wracking, but then I became accustomed to it. Then, a group called me about conducting their event of 600 people … then 800 … and now I’ve worked events with crowds of over 1,000 people. But early on when I was talking with a organization about my benefit auction services, they wanted to know how many other events I’d worked in their size range. I couldn’t give them a satisfactory answer. The erratic pay structure leaves some people uneasy. The markets I currently work are seasonal: spring and fall. If I’m not working, I’m not getting paid. In the summer and deep winter, I have few paydays. Some can’t live like this. Regardless of the reasons, full-time auctioneers aren’t as plentiful as many other professions. * A few years ago I saw a statistic from the National Auctioneers Association that estimated ~7% of all auctioneers are female. I believe that most of these women auctioneers are real estate agents who have added auction services to their brokerage to round out their service offerings. Benefit auctions are a close second choice for female auctioneers, although perhaps only a dozen make a living career of it. For most it’s a hobby, at best. And I can count on one hand the number of women I know actively selling in the auto and livestock auction rings. (I’d never want those jobs, but to each her own.) Those specialties are still male-dominated, but I’m sure there are some women auctioneers working to advance in those fields. Maybe those women are even blogging about it, and I just don’t know it. I happen to know a very well known woman auctioneer. My Sister, Wendy Hendrix Rierson. and my father continued as a well known auctioneer. Since then, My sister as well as my brother have become auctioneers. If you are ever in Cana, Virginia stop by Hendrix Auction Barn. You will simply be amazed at the unique experience of a great bid caller !! Hi Sherry, I am preparing to attend auctioneering school in January. I have worked for years in the business/higher ed world, and I am now ready to embrace my passion….antiques and auctioneering! Can you tell me where you learned your auctioneering technique? And, perhaps give me one piece of advice! Also….I must add, I think we hail from the same part of the country…I am an ESU Hornet (former student, alum, and employee)! Stingers up! Good for you, embracing your passion! I attended Missouri Auction School, but I think their quality has diminished (a cousin of mine went a couple of years ago, and from what I heard about it, I didn’t think he got a great start). Worldwide College of Auctioneering … Repperts … Texas Auction Academy … you might try them. Or better, visit the National Auctioneers Association website and do a search. I’m sure they’ve got some listed for you to review. You can visit websites and see if there is one that sounds compelling to you or has better dates, for instance. Oh — and yes, I graduated from ESU (and worked there, while on campus). Woot woot! Thanks for your tips, Sherry!!! 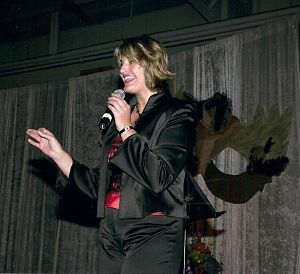 I attended Worldwide College of Auctioneering in Clear Lake, IA, and had the time of my life! I enjoyed every bit of the class, meeting instructors, and making new friends among my classmates. I am looking forward to the next step of my journey!!! Congratulations, Dianne! I went to auction school as a vacation, thinking it would be fun. While there I thought, “Hm. Maybe I should do this part-time.” Lo and behold, it grew and grew. I’ve found it to be a lot of work – but also rewarding – to own my own business. I’m sure you will, too. I’ll be attending NAA’s Conference & Show in Louisville soon. If I don’t see you there, I’m sure we’ll cross paths somewhere.